Check out the teensy origami box I attempted. Success! But I think I muttered, "Wait. What?" about sixteen times while making it. I ignored the recommendation to start with a large sheet of paper and went for the 3 cm box, following this instructional video by Sara Adams. She demonstrates a design by Dave Brill—which must be short for brilliant, because who in the world figures out how to fold a box with a hinged lid from one sheet of paper? Happy Folding is a fun site with lots of other how-to origami videos. For example, maybe you need a Valentine origami ring to put in that box. This is a great idea to use to wrap a small gift or special treat. Thanks for sharing! This would be perfect for chocolate covered cake balls! Did she stop and answer you when you asked "What?" There is an excellent documentary available on Netflix about origami called Between the Folds. Thanks for sharing this project! Looks great! Agreed—Between The Folds is great! YES. I have been on a huuuuuuge origami kick lately! I've been experimenting with going over my paper creations with Mod Podge to make them a little less flimsy. Oh, something that cute deserves a real ring inside it! Well, done... I may need a magnifier to attempt this! Great idea! I needed this last weekend to wrap a 5 year olds birthday present. Hair clips are a little awkward! I'm in awe, beginning with a simple sheet and finishing with a box like that is just incredible ! I made one today, it won't be the last one ! Thankyou again ! I made the box several times years ago, but each time I sweat! Not an easy one, but so clever!! Very, very cute! Thanks for sharing! Thanks for sharing this. 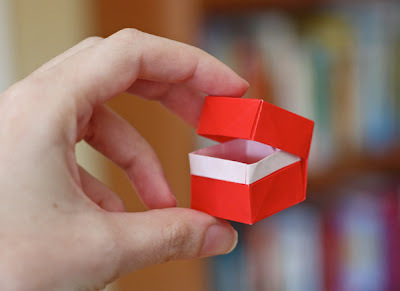 I love origami, so I might have to try making that little ring and the box to put it in! Such a cute, tiny box! I've never tried one like this...thanks! Anonymous, you came, you folded, you conquered! I came thiiiiiis close to throwing in the towel at one point, too. Good work. It looked like origami chattering teeth before I clicked on the thumbnail. Ha, someone needs to figure out how to make that! I can't open it can someone help me?